Return to Bricksburg where everything is no longer awesome. Picking up where the first LEGO Movie left us, and jump right back into the action as the invaders from planet Duplo threaten the very existence of Bricksburg and its inhabitants. After the Duplo invasion reduces Bricksburg to a city that is barely recognizable. Now living in a dystopian society, a mysterious figure arrives and promptly kidnaps several of Emmet’s (Chris Pratt) friends, including Lucy/Wyldestyle (Elizabeth Banks). Emmet sets off on his rescue mission to save his friends, but along the way meets allies and enemies who test him at every turn. 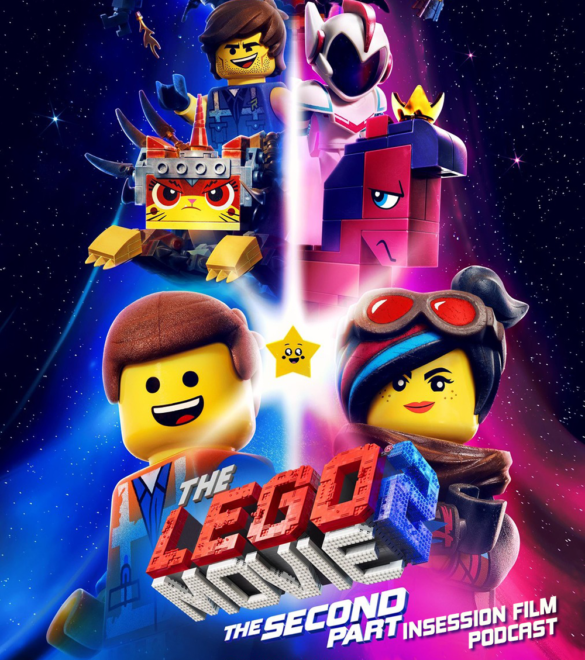 I enjoyed LEGO Movie 2 nearly as much as the first one! Unfortunately, hosts JD and Brendan do not quite share my sentiment; however, they provide some great talking points! But the only way for you to find out what we think of this movie is to listen to the episode. For the full review, visit the InSession Film website for the podcast and written review! And if you don’t do so, follow InSession Film on Twitter and subscribe with your podcast service. And you can also listen to the episode by clicking HERE.